Card #1: I love shaped cards so I was super excited to see this Snow Globe from My Time Made Easy included in our kit! I thought the embossed snowflakes were just gorgeous by themselves so I just added some Prisma Glitter over the raised areas. Even that little snowflake button was included in our kit! Card #2: I have been eyeing a certain little polar bear stamp and matching die from Memory Box so I was tickled to see it in my kit too! Cathy even sent the matching pattern paper so I decided to pair them up! Thanks so much for joining us this month! Thank you Cathy for a fabulous kit to work with! More cards to share next month where we have a new hostess and the goodies have arrived and they are adorable! 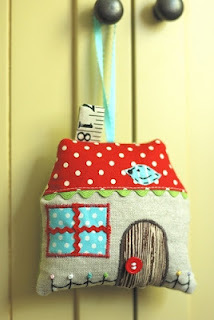 Until next month, go check out what these very talented ladies have done with Cathy's kit! 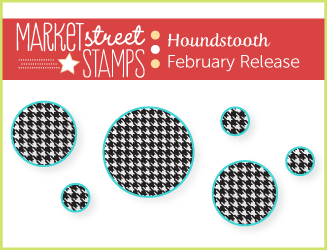 I decided to ink up Neighborhood and pair it with the Houndstooth background. This was a super easy card! No coloring except for those tiny red hearts. <3 I sorted through my buttons and found this one button that has a heart shape in the center.......perfect!!! Hi-ya! I'm a little late tonight with my post but it's here now! I was out enjoying the AWESOME weather we had today and into this evening. I'm talking 70's today and 50's tonight. Beautiful weather and I had to take advantage of it and go for a nice long walk! 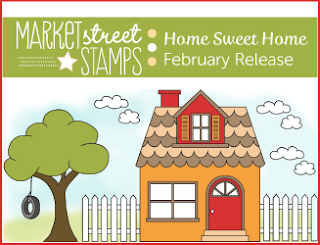 Today we are introducing another new stamp and this one is AWESOME because it shows off one of the hottest trends! It is a HOUNDSTOOTH background.....but it is not just some Houndstooth background. It's a smaller scaled Houndstooth pattern. Thank you Tifany DeGough for designing this background......it is going to get a lot of use! 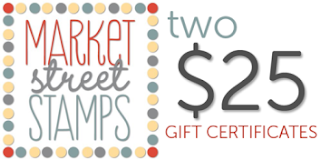 Have you checked out Market Street Stamps backgrounds yet? They fit an entire cardfront.....just perfection. So for my card, I paired Houndstooth up with yesterday's set called Riding By for a little 'retro' love. This card is already addressed and ready to send out to a very special friend! She loves her bike and she indeed has an orange bike too! And guess what? She even has dogs so the tiny dog in a basket stamp was perfect for this! 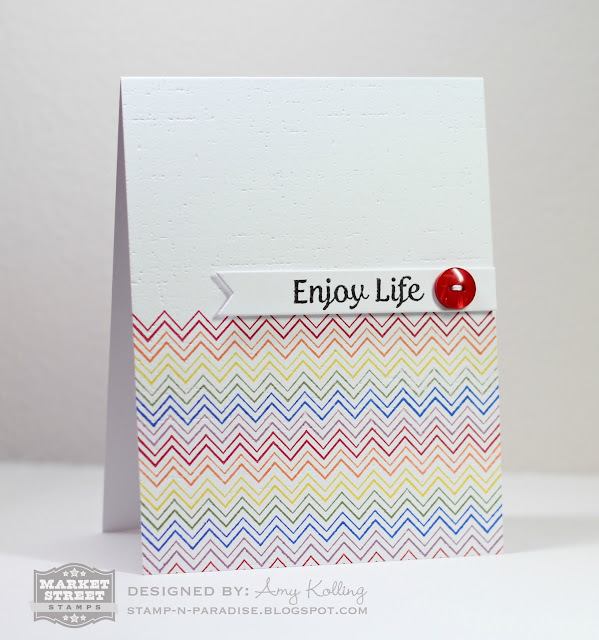 My sentiment was white embossed onto the Houndstooth background. 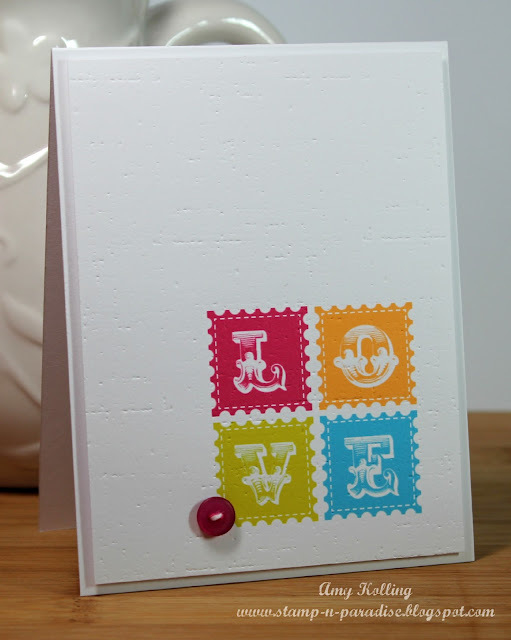 I have to mention that this sentiment is NOT curved in the set but with clear stamps, it's so easy to do!!! Remember here are the details of this release and don't forget to leave those comments for a chance to win the featured set(s) that day! 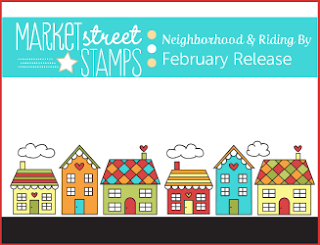 ■The new release stamps will be "sneaked" on the MSS blog Monday-Wednesday at 7PM Central Time! ■The full sets will be revealed on Thursday night! 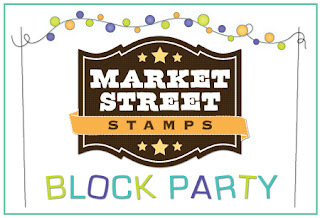 ■Stamps will be available for sale following the reveal Thursday night! ■The new release stamps will be 15% off in the store for an entire week following the release!! Want all of the sets? If you order the whole release they'll be 25% off for an entire week!! Welcome back to the Market Street Stamps New Release Day #2. Today the DT is showing off 2 more new sets that are just as great as Home Sweet Home that was peeked yesterday. I chose to ink up in a rainbow of colors the zig-zag stamp that is included in this set. Holy cow.....it was the easiest thing ever to do! I can't wait to use this stamp often! 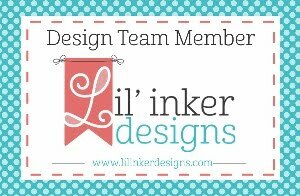 My sentiment was stamped on the little banner die from Lil' Inker Designs. I think it's just the angle of my photo but my sentiment IS straight.....sorry about that! Well, hellllooooo! It's been a week here on the 'ole blog. A very LONG week. Something that has been occuping my time lately is that we are going on vacation over Spring Break and I've been working hard at getting back in shape. I did steal some time and prepared some projects with the newest stamps from Market Street Stamps! Today we are sharing Home Sweet Home. This set is illustrated by Samantha Casey and just wait until you see what all is included in this fabulous "home" set! Sam did a terrific job designing this set and I see myself using it LOTS! This set is just packed full of fun images to decorate your own Neighborhood! Too too cute! Here I've stamped one of the houses, colored in with Copics, and cut out. The chimney and dormer window is paper pieced and popped up with foam tape. I then stamped and cut out my little fence images and ran them through my Big Shot with the woodgrain IP just for a little weathered look. 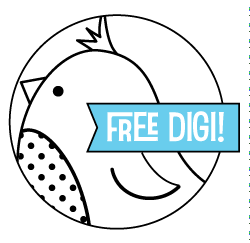 Now, make sure to take some time and browse my fellow DT member's blogs for even more inspiration using Home Sweet Home!! Today is my day over on the Market Street Stamps blog. Since tomorrow is THE day of LOVE, I thought I'd post one more lovey card. I can't help myself. I've always loved this cute little guy from the Ocean Fun set. My image was colored in with Copics R22 and R24. I had to add a bit of sand for him to stand on with Copics T1 and W3. VERY simple. 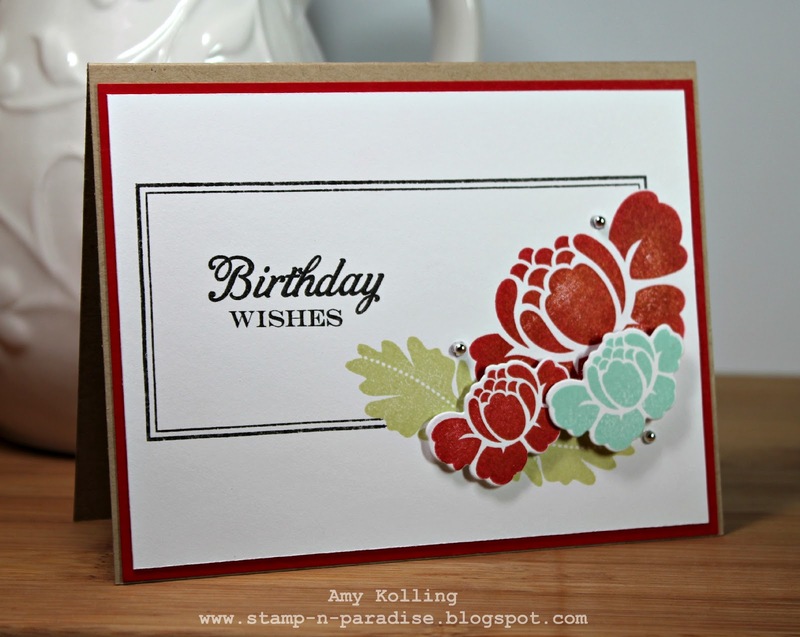 I finally finished a card for today's Papertrey Ink challenge. I have lots of distractions at my house this weekend........My creative friends Jen Carter, Laurie Willison, and Barb Foster are here for some crafty time! Some of us have cranked out the cards this weekend (no names mentioned) but I on the other hand have just enjoyed the company. I'm sending this over to Simon Says Stamp challenge this week.........Love is in the Air! Hi everyone! 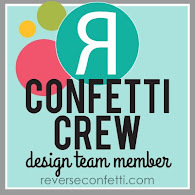 Today there was another challenge by Nichole to use one of the Design Teams favorite color combinations of last year. Scrolling through their choices, I knew immediately which DT member I was using as inspiration. 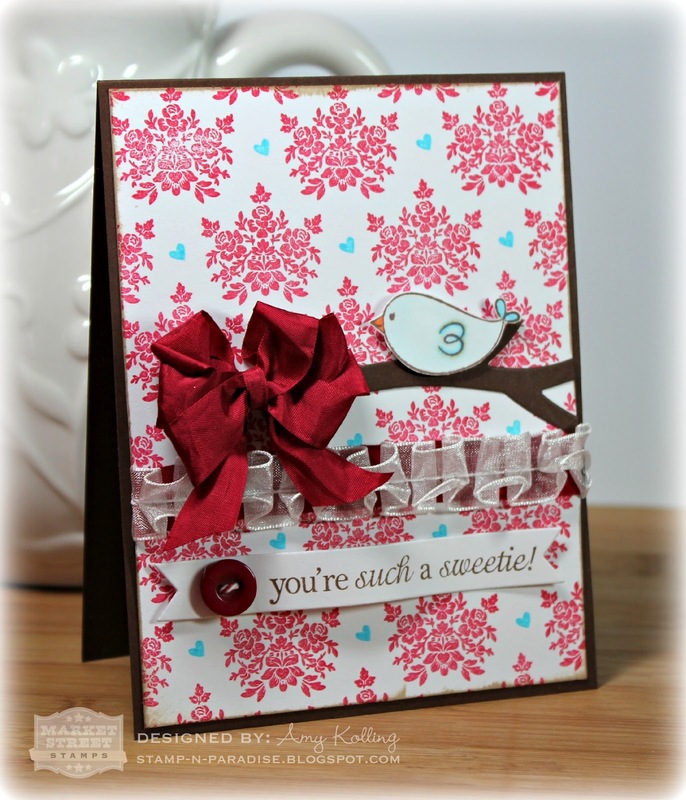 My eyes stopped on Lisa's beautiful color combo and I knew it would be perfect to use with the Rosie Posie stamp set. Here I've used the frame from Take Note and masked off the right corner so that I could directly stamp my Posies to the card base. Then my smaller posies were die cut and lifted with foam tape for dimension. I have to admit the sentiment would have been a nightmare if it weren't for my trusty Stamp-a-ma-jig. Perfect with that tool! 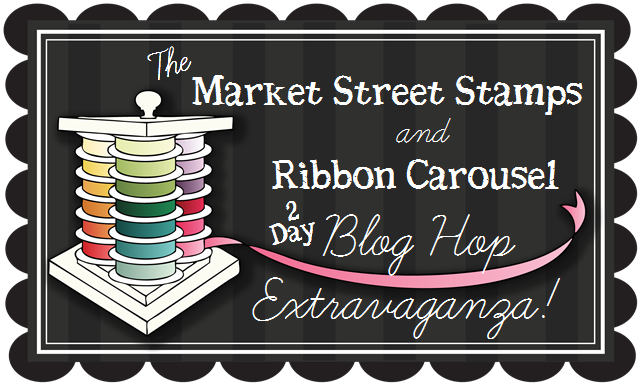 Market Street Stamps and Ribbon Carousel 2 Day Blog Hop!!! Welcome to Day 2 of the Market Street Stamps and Ribbon Carousel Blog Hop! 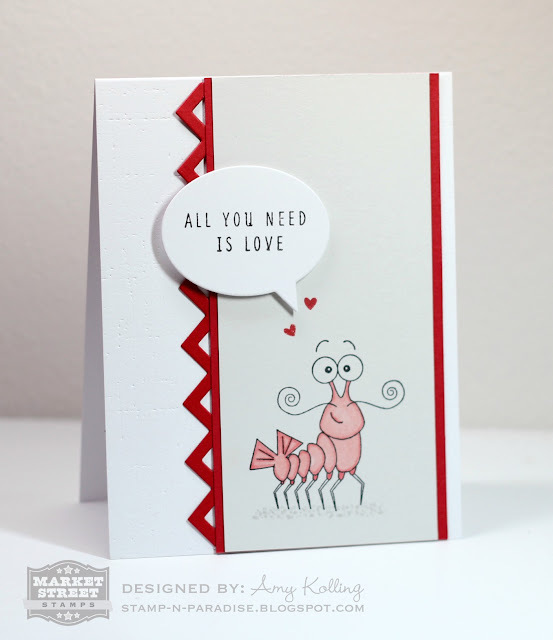 This is the 2nd day of goodness from both DTs where we are showcasing stamps from MSS and gorgeous ribbons from RC! And did I mention prizes?? I'll get to that at the bottom of my post. When I received my ribbons in the mail from Ribbon Carousel, I was just BLOWN AWAY. 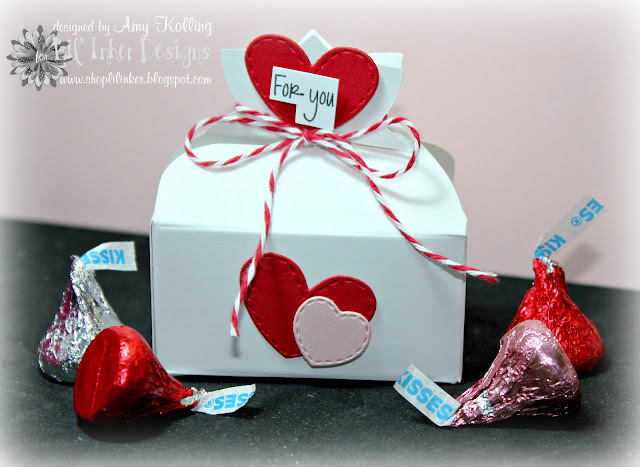 I chose to work with the January Valentine Ribbon kit. OMG. I was literally amazed at how much ribbon was in this kit! Everything from seam binding, twine, sheer ruffles, chevron, to stripes. Pure gorgeousness!! From my kit, I chose to work with the sheer ruffles, cranberry seam binding, and twine. I had to go with something a little more vintagy and I think I pulled it off! Using MSS awesome background set, Grace, I stamped it and added in some tiny hearts from Follow your Heart. The cute bird and sentiment also come from this set!! 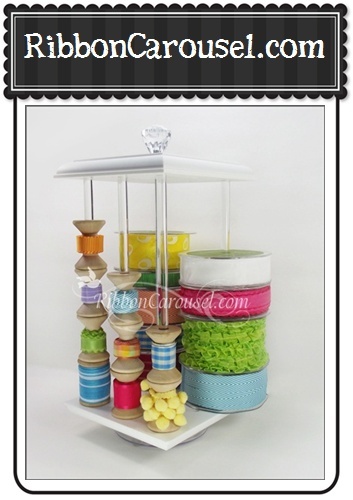 a newly released Ribbon Carousel! 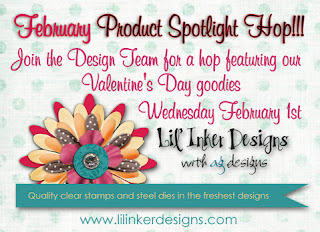 The winners will be announced on both blogs on Tuesday, February 14! We hope you enjoy the hop! I'm back with another cute cute image from Beth Silaika.....the little honey bee and it's adorable sentiment! I really am enjoying using these digi images the stamp designers have put out to use for this challenge! I guess I'm embracing my inner CAS style with these but I love how they've turned out! I'm loving this week.....I have some days off and am able to play along with these challenges! It's the Papertrey Ink 5th Aniversary celebration! Today we were challenged to use these fabulous digi images provided by all the PTI stamp designers. You can find them HERE. I chose to work with this colorful LOVE image provided by Melissa Bickford. I love the font she chose and the postage stamp look! I printed the image on SS White cardstock, ran it through my Big Shot with the Linen Impression Plate, and sewed one lone Raspberry Fizz button with twine from the Twinery. Easy Peasy! Very quick post today as I'm waiting on a phone call from work to go in. Gosh I dislike being on call but hey it's part of my job. But as I waited, I wanted to get something made for Day 1 of Papertrey Ink's 5th Annviversary Celebration! First.......again I have to mention this weather! Seriously people! I was fortunate to have lunch with a friend yesterday at my most FAVORITE place.....Chipotle.....outside.....without a coat!!!! Yes, you heard me.....February 1st. I am loving every minute of this!!! But I digress.......the REAL reason I'm here today is to showcase the Valentine goodies from Lil' Inker Designs that were previously released on January 20th during the January release! 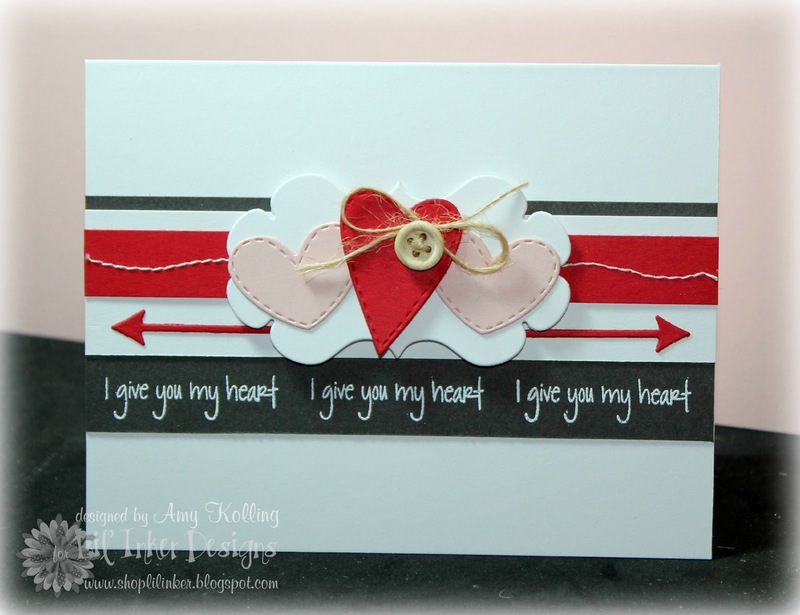 I used the Of the Heart dies and sentiments for my card today. Lots of layers and NO pattern paper! My sentiment was stamped in Versamark and heat embossed with White Filigree Embossing Powder. 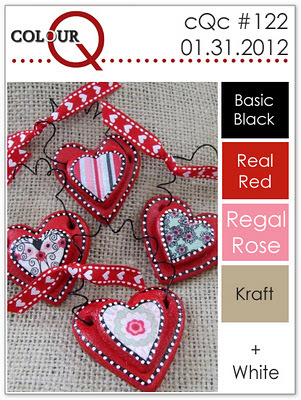 I LOVE LOVE the signature detail of the little perforations on the hearts!!! I've used the colors from the Colour Q challenge for this week. I snuck my kraft color in there with the wood button and button twine. Hope that's ok! Well.....that's it for me. Remember this blog hop FULL of inspiration using the new Valentine goodies goes on Friday and Saturday too! 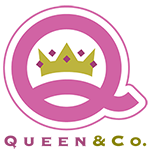 Your next stop is Alicia's fabulous blog! 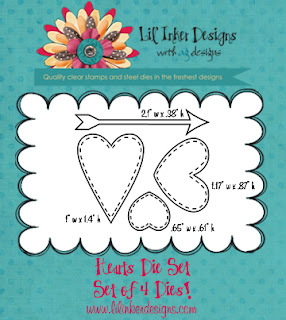 Why not go pick up your own set of these cute hearts?? You can HERE. ;) Thanks for stopping by!